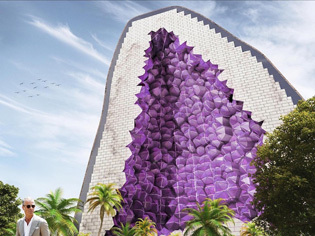 The Amethyst Hotel is China’s latest architectural gem and marks the first in a chain of gemstone-inspired hotels. 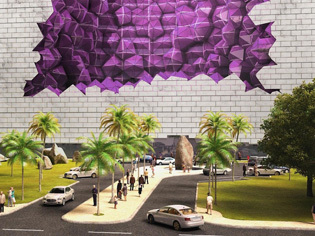 Inspired by purple amethyst crystals formed inside rock, the Amethyst Hotel marks the first in a chain of gemstone-inspired hotels, where guestrooms are housed behind coloured faceted glass. 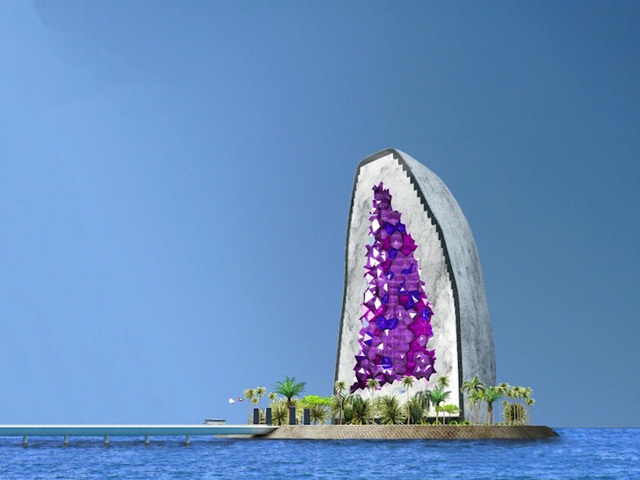 The first of the hotels is planned for construction on Ocean Flower, a manmade island in China. Rather than rely on internal corridors, entryways to rooms will be threaded along the outer perimeter of the structure, creating a circulatory corridor that spans the width of the hotel. This arrangement allows every room to enjoy panoramic views and an abundance of natural light. Windows, sheathed in tinted crystal shards, will face towards the building’s central atrium. At night, the hotel’s central crystallised void lights up to create a vibrant glowing effect. In contrast to the purple crystalline windows, the interior features a mostly cool and gray toned minimalist design. The cathedral-like appearance of the building is meant to evoke feelings of grandeur and a welcoming sense of hospitality. Amethyst was chosen as the architectural inspiration due to its spiritual significance; it is believed to bring good fortune, heal illness, and calm the mind. 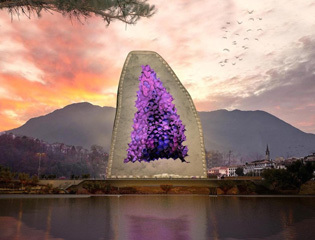 "The Amethyst Hotel has the potential to become a performative symbol – a symbol with actual powers associated with it," NL Architects commented. The chain of gemstone-inspired hotels is set to be constructed in different locations around the world, and will similarly feature hotel rooms lining a sensational void.